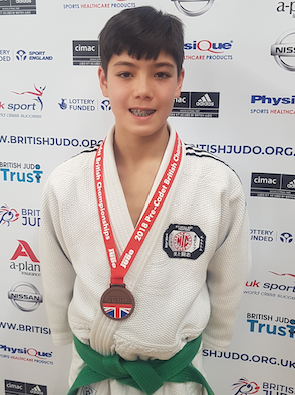 OWEN Lambert (13), from Harlow Judo Club, was the sole representative who made the long trip to the English Institute of Sport, Sheffield, to compete in the very prestigious British Championships held at the venue annually. With the 5-mat event split over the weekend, Owen competed in the Pre-Cadets section which was held on Sunday and is always a very well attended event attracting the best players from all over the country. With 24 players in Owen’s weight group (u42 kg), split over 2 groups, it wasn’t going to be easy. In Owen’s own group, he sailed through the first round winning easily. Unfortunately he lost the second round due to a technicality but sadly, the referee’s decision stood which meant that Owen was out of contention for the Gold medal. Dropping now to the repecharge, this meant the young player had to win every fight, make it to the cross-over and continue winning with a chance of earning himself a Bronze medal. With a total of 7 fights under him, holding his nerve, the young judoka displayed scintillating explosive techniques which drew gasps from those watching his mat and where he fought his heart out. Giving more than 100% in every fight, he took the hard earned Bronze medal in his last fight of the day to become a National medalist. One Response to "Judo: Owen fights hard to win Bronze at British Champs"
Fantastic achievement Owen. It was a pleasure to watch you.